Delightfully smart. Unforgettably tasty. 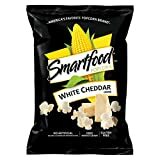 Smartfood White Cheddar Popcorn is made with real ingredients and air popped whole grain kernels. The 40 individually wrapped bags are great for packing lunches and enjoying on the go.